And now for something a little different. I’m in the mood to talk about some Masters of the Universe toys. In 1982 the world of He-Man was full of colorful characters. A barbarian, a skull man, an animal man, a fish man, a bird man, and more. When Mattel expanded the line for 1983 they included more men, but these all had different exaggerated body parts like a man with three eyes, a man with a metal jaw, and a man with a metal neck and so on. In 1984 Mattel revisited both ideas for the new line-up. Men with giant metal hands, plus a bee man, lizard man, a crab man, a snake man, and a spider man. The line would continue on like this through 1987, leaving us with 2 or 3 insect people depending on how scientific you want to get about these humanoid bugs. To help Masters of the Universe sell well it was supported by cartoons and comics to get kids excited about the world of Eternia and all the creatures that lived their. 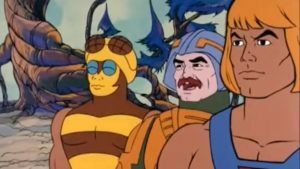 In the early day of Masters of the Universe, while the number of characters in the toy line was fairly limited the He-Man cartoon was first released for syndication. Making 65 episodes about only a handful of characters prompted the people at Filmation to create a lot of one-off characters. 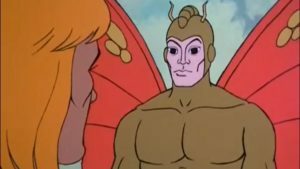 In the episode Eye of the Beholder He-Man meet some bug people who have six skinny limbs and are much more bug like than human, despite standing upright.. 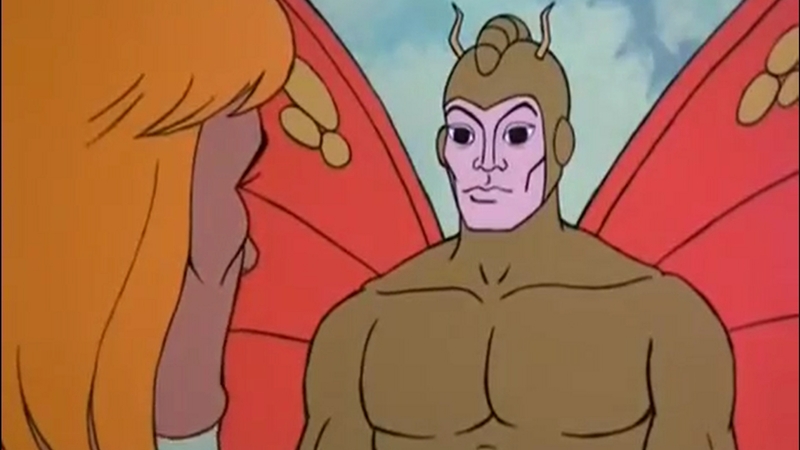 Right away one of the insect men points out how ugly He-Man is to them. 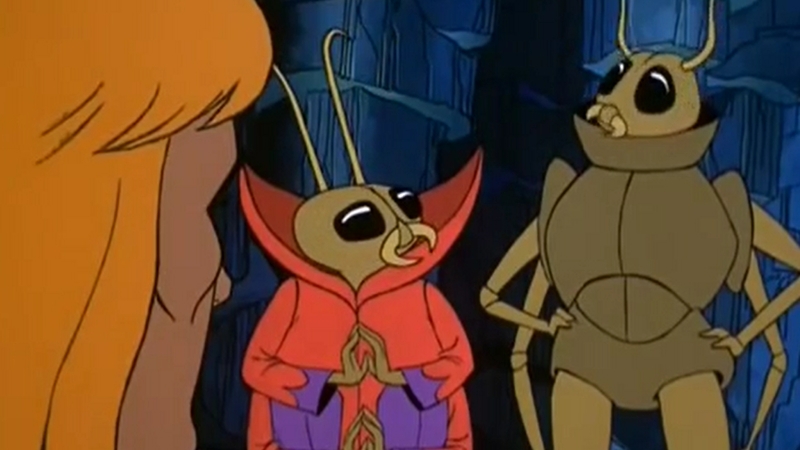 “He has no shell, disgusting!” One of the insect men, Garth, points out it is wrong to judge He-Man by his looks because the insect men must look strange to He-Man. Later in the episode Garth sacrifices himself to help save Eternia’s environment and all it’s inhabitants, symbolically showing his courage and beautiful heart. Moments later Garth emerges from what seemed like a watery grave in a new evolved form that conforms much more to the human standard of beauty. His once six skinny bug legs are now a pair of muscular human arms and legs. His face which once consisted of round bug eyes and insect mandibles is now a rugged square jawed human face. His insect shell now looks more human shaped and Garth now sports butterfly wings. Garth finishes the episode looking more like a Masters of the Universe action figure than he started it. 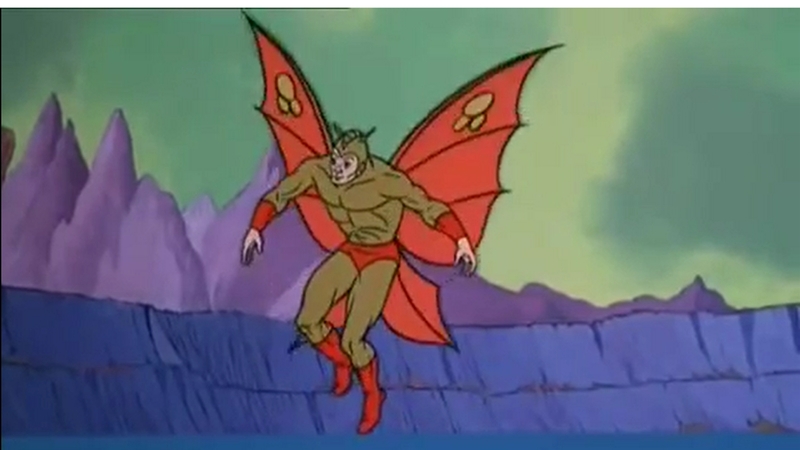 In 1984 Buzz-Off, the Heroic Spy in the Sky was introduced to the Masters of the Universe toy line. 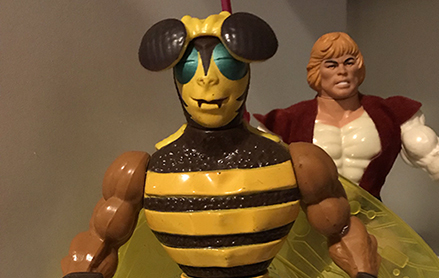 This humanoid bee was a hit with kids and a powerful ally for He-Man. Buzz-Off had a friendly face but hands and feet straight out of a radioactive bug movie of the 1950’s. His torso was shared with the lizard man, Whiplash. The stripes were painted dark brown and yellow this chest worked great for Buzz-Off. His hands were small pinches and odd choice for this insect man, but then again everything was kind of an odd choice. Buzz-Off was a bee with only four limbs, no insect abdomen, but he did have wings. The designers at Mattel were happy with their concoction of new and recycled body parts, so they moved on to accessories. Since his happy head had green bug eyes and short antenna they gave him a brown & yellow bee hat featuring brown bug eyes and longer antenna. For his second accessory, rather than giving him a spear or a sword that might invoke the image of a bee’s stinger, the designers have ol’ Buzz-Off a fire fighter’s ax. 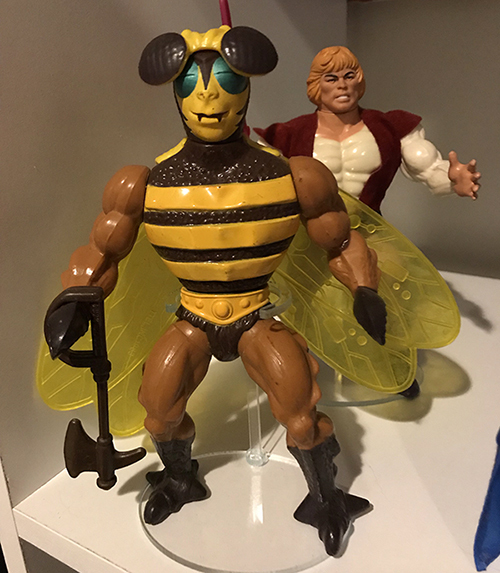 The mini comic that came with Buzz-Off and several other figures in ’84 was called He-Man and the Insect People. 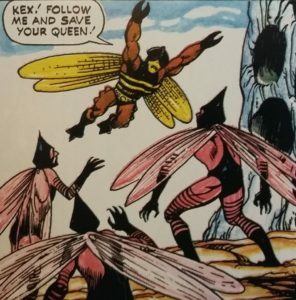 This book told the story of the Kex, a race of Insect People from the world of Masters of the Universe. The Kex have a similar look to Buzz-Off, but they aren’t bee people. They have pink wings and mostly black bodies. The Kex also seem to be a bit thinner in build that the true “Masters” characters. The Kex do have pointed heads or helmets that feel like stingers. Also in 1984 Mattel released Webstor, the Evil Master of Escape. He might not be considered by some people to be a insect person since spiders are arachnids, but I’t didn’t feel right leaving him out. Webstor has an even more human appearance than the previously mentioned Buzz-Off. His face features red beady eyes that give him a bug vibe. 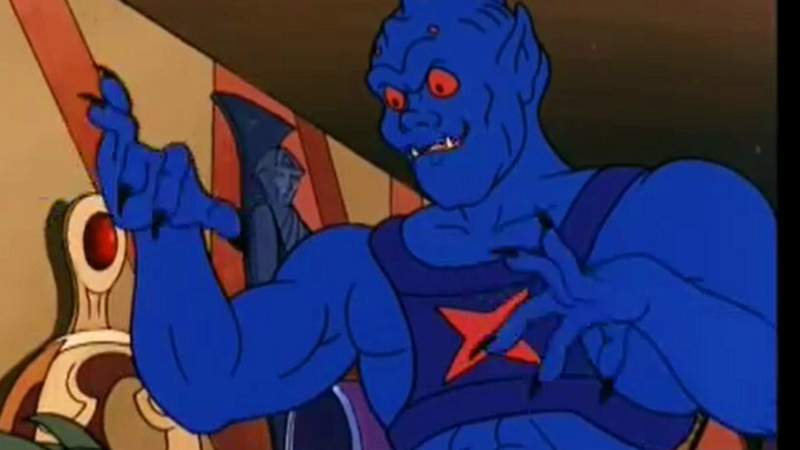 Webstor had darker blue skin than Skeletor, but reused the same “monster” arms and legs as the Skeletor figure. These limbs have some extra spikes, fins, or toes, but certainty aren’t insectoid. Webstor wore black chest armor with an odd symbol, which is often though of as the black widow hour glass, but it is more of an ‘X’ over a diamond. The really cool thing about Webstor’s armor was that it contained a grappling hook and line that could be used to allow him to scale playroom walls. His final accessory was an orange blaster. Maybe it’s a web gun? Webstor’s most memorable cartoon appearance was his debut in “The Cat and the Spider” from the second season of He-Man & The Masters of the Universe. Webstor was show to be a capible thief. 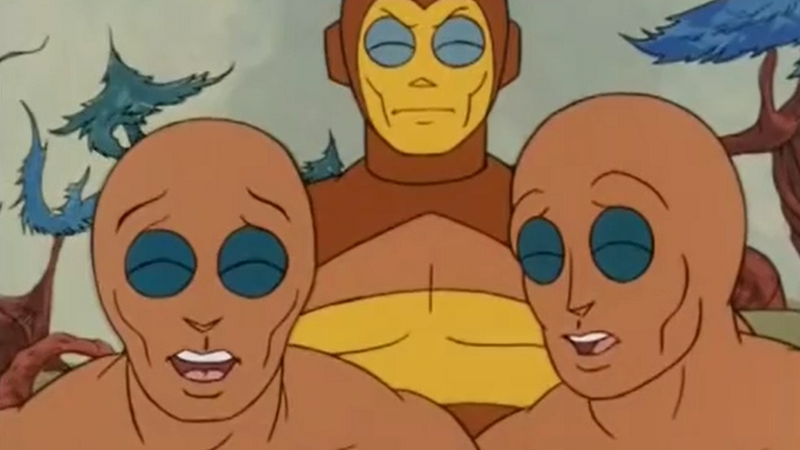 In the epsiode Webstor even talks back to Skeletor call him names, which Beastman and Trap Jaw never dared to do. We frequently see him hanging from his grappling hook and line. This episode focuses more on cat people rather than insect people. The season two episode that focuses on bug people the most is called The Good Shall Survive. In this episode an ancient race of insect people called the Tycons awake and attack the bee peoples supply of honey. The Tycons kind of remind me of Zorak from Space Ghost and the Brak Show. 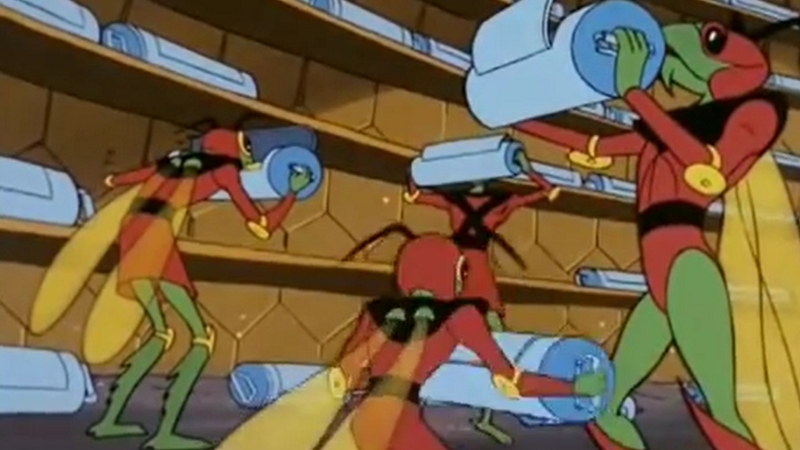 These skinny insect people have green skin and wear red and black uniforms. They only have four limbs, but their slender builds, insect like faces, and wings make them much more bug-like than many of the Masters of the Universe insectoid action figures. The Good Shall Survive also features the bee people. 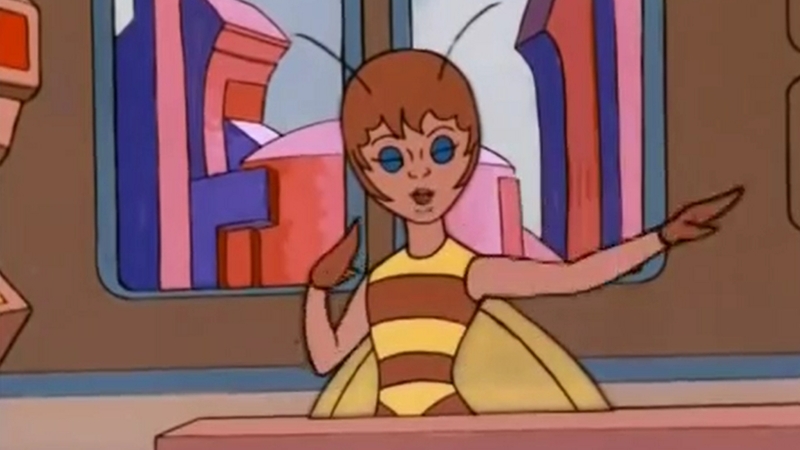 This is the race that Buzz-Off comes from, yet there are odd inconsistencies between all the bee people’s designs. Buzz-Off looks similar to his action figure having a yellow face framed by the rest of his head in brown. In the cartoon he also always wears his yellow bee hat. 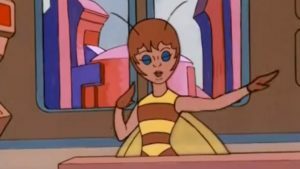 There are a handful of other bee people in the episode. There are some generic bee men who are bald and their entire heads are flesh-tone, while there is another character that matches Buzz-Off’s coloring but has odd “boxes” over his ears like an old fashioned Sci-Fi space helmet. The final style of bee people, which cracks me up the most is the little girls who all have British Invasion inspired hair cuts. They are bees in a Beatles wigs. Then for a while there were no new notable insect people in Masters of the Universe until 1987 when Mosquitor joined the ranks of the Evil Horde. The Horde were He-Man bad guys in action figure form, but She-Ra villains in cartoon form. Mosquitor who was released after both the He-Man and She-Ra shows had ended was labeled the Evil Energy-Draining Insectoid. 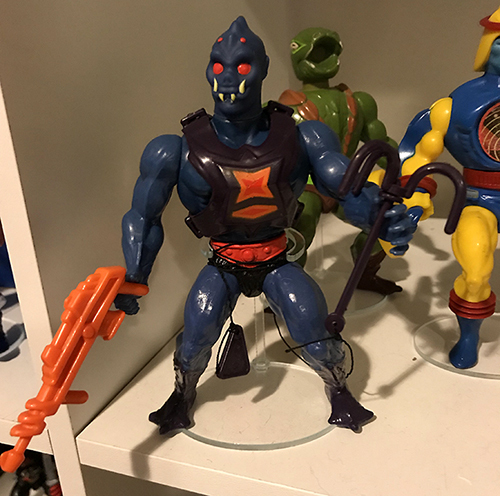 Mosquitor was one of the last figures released for Masters of the Universe. Mosquitor, and has a somewhat mechanical appearance. The mini-comics show Hordak experimenting on people to create Dragstor. 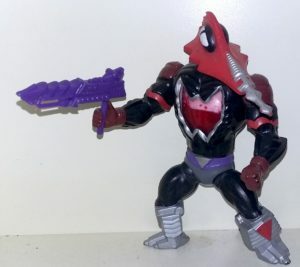 In 1987 it was unclear if Mosquitor was a man with mechanical bug parts made by Hordak or if he was an insect man who was augmented with some mechanical parts later. Mosquitor Has a large red triangular head with a silver proboscis used to stab a victim and drain their energy. The figure has an amazing action feature that makes “blood” drip down the walls of his clear chest cavity and fill his insides with the rapid push of a button on his back. 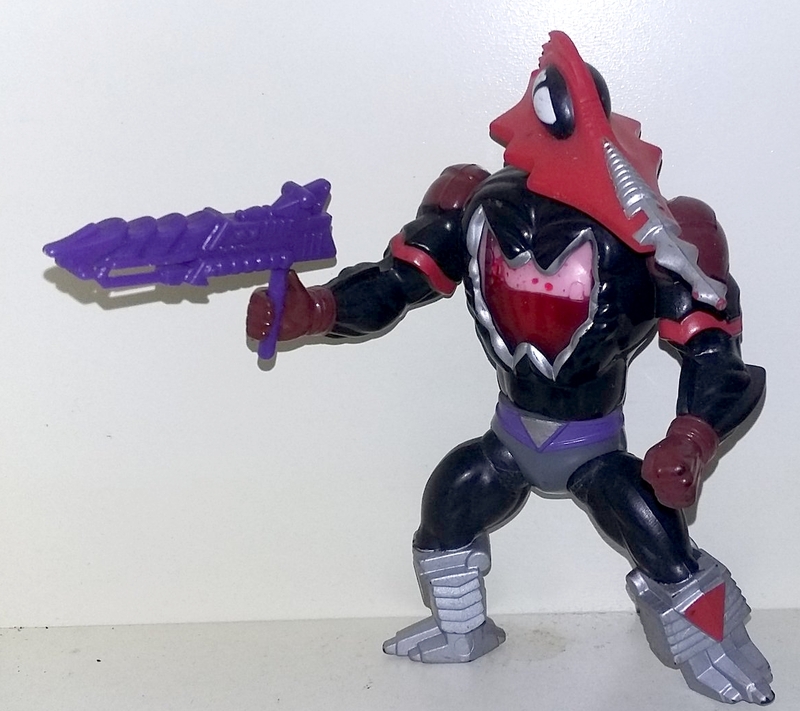 Mosquitor also came with a purple gun that seems to also be able to “bite” victims. The World of Eternia was a great environment for a child’s imagination. This other world was full of so many vibrant and interesting characters. Most toy-lines have a hand full of characters with a paragraph on the back of the package explaining a weak back story for the characters. Masters of the Universe had multiple years worth of action figures, mini-comics featuring characters exclusive to these pack-in freebies, and a massive amount of cartoon episodes also featuring new characters. If you can imagine a creature crossed with a human to make a character for Masters of the Universe they probably did it. Insects and humans were a popular combination but they all had an unusual combinations of people and bug parts. Which insect person captured your imagination as a kid? It’s like the chimaera ant ark in Hunter x Hunter. Dude, so cool!!! I remember all those figures. My older brother still have them! I love them. This article was full of randon useless knowledge about this collection, something that I love. Thanks pal! Long live MOTU.